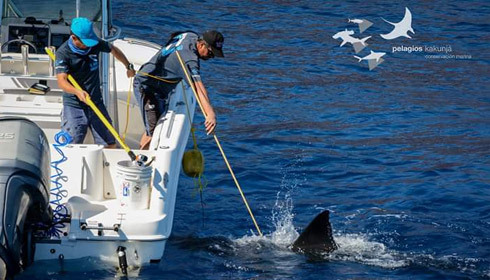 Great white shark research is vitally important to ensuring the species continues to thrive, and Shark Diving Xperts are involved with a range of projects designed to further our understanding of these incredible animals. Leading on-site great white shark scientist Dr Mauricio Hoyos has been conducting research on Guadalupe’s shark population since 2004. 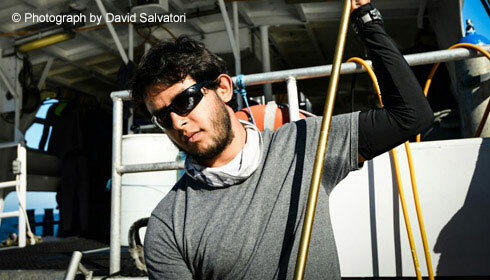 Stationed on the Island for the duration of the season and conducting his work from a small research boat, no one has more of an insight into shark behavior here due to his passion, dedication and many hours spent in the field. Directly aiding Mauricio is his team of biologists, all bringing varying degrees of experience and knowledge to the studies. Together their work also includes tagging, biopsy taking, photo identification and will often board our vessel during our shark trips to conduct a lecture and an evening of questions and answers with our guests. The ID database of Guadalupe great white sharks was started in 2001 by Nicole Nasby Lucas of the Marine Conservation Science Institute. Her commitment to the project has now enabled us to recognise over 250 individual animals and keep records of their sightings here each year. By contributing photos of the sharks during our expeditions to the Island, SDX has created a successful partnership with this project. 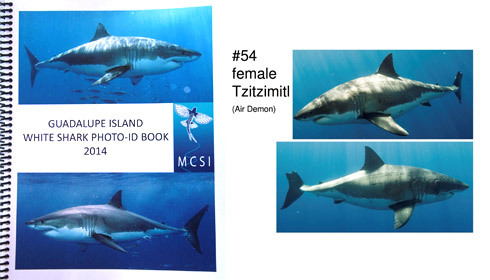 Additionally to the ID database, MCSI has been involved with multiple tagging expeditions and by combing these two forms of research have created the most comprehensive study of white shark migrations along the Pacific coast. The Waterman project lead by William Winram, Fred Buyle and Lukas Muller have ran many tagging expeditions at Guadalupe over recent years with great success. Most notably, their expedition in 2014, where they placed 15 tags and took 7 biopsies, aiding Dr Mauricios Hoyos and Dr Yannis Papastamatious’ scientific studies. 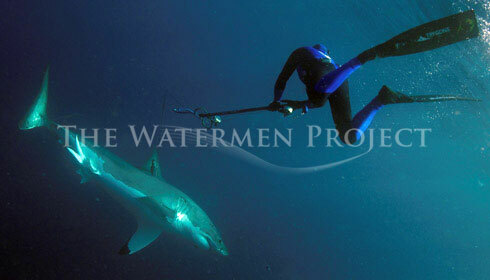 By using freediving techniques that require specific permits to get close to the animals the team are able to interact with the sharks peacefully and respectfully when conducting their studies. We look forward to working on many more successful expeditions in the coming years together. In 2014 Ralph Collier of the Shark Research Committee worked alongside Guadalupe’s’ student Biologist Edgar Becerril and Discovery Channel to take DNA samples of the island's sharks, specifically the mature females. During the two week expedition (which featured in Shark Weeks’ “Return of the GW serial Killer”) many skin biopsies where taken for genetic analysis. The goal is to identify differences in great white shark populations of California, Guadalupe Island and the Gulf of Mexico. This is a project we are very excited about and will be running scientific charters with both Edgar and Ralph into the future to continue these studies.